Born and raised along the Wild and Scenic Rogue River in Gold Beach, Oregon. Bachelor of Arts degree with a major in physics and mathematics from Willamette University. S.E.A. semester aboard 125 ft. oceanographic research sailing vessel R.V. Westward sailing across the Atlantic Ocean and into the Mediterranean Sea. (www.sea.edu). Followed by extensive sailing and exploration in various oceans and continents of the world. Nature and Island lover at heart, moved back to Gold Beach along the Southern Oregon Coast. An island region rich in natures biodiversity isolated on the Pacific Ocean Coastline of the North American Continent. Truly a nature lovers paradise on earth! 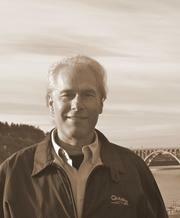 Over thirty years experience in land surveying, land consulting, and real estate experience along the Southern Oregon Coast. Consultant, planner, and developer of over 200 eco-friendly ocean view and ocean front parcels of land including the following projects in and around the Gold Beach and Rogue River environment: Surf Hills, Old Sheep Ranch, Sunset Ridge Estates, Hubbard Mound Ocean Front, and presently Pacific Vista, Salmon Ridge, and Pacific Rogue Ranch.